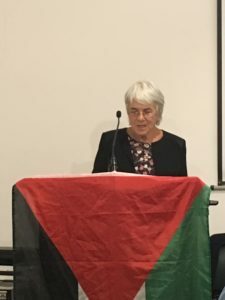 I very much welcome the opportunity to speak here today, because there has been a long history of progressive anti-racist, anti-imperial struggle in this country – in which, it goes without saying, Jewish organisations and people have played a very full role, with their (our) long experience of fighting anti-Semitism woven into the struggle. The way that the media and politicians are discussing issues of racism today divorces anti-racism from the progressive fight based on the expansion of justice among all oppressed groups, and in doing so, makes a mockery of that history and the principles we fought for. In a small way, I have been connected to that history, through my involvement since the late 1960s, not just with the IRR and through my work as a lawyer, but with legal defence campaigns, such as the Bradford 12 defence campaign and the Southall 342; with refugee and migrant organisations such as the Commission for Filipino Migrant Workers and the Refugee Forum; in Women in Black, a group of Jewish women protesting the killings of Palestinian children; Women Against Racism and Fascism – and as a proud member of the CARF collective. It took thirty years to convince the establishment that racism was not a matter of individual prejudice or xenophobia, but an issue of structural and institutional racism. As is by now well known, the acknowledgement finally came with the Macpherson inquiry into the death of Stephen Lawrence and the Met police investigation of it, but many, many campaigns against racist violence and deaths in police custody preceded that. In all those campaigns we strove to build unity in the fight against racism. But in doing so we accepted that not everyone’s experience of racism was the same – colour, class, gender, sexuality, religion mark you out in different ways as more vulnerable to racism. So Sivanandan’s saying that there were two racisms, ‘the racism that discriminates, and the racism that kills’ was a very important organising principle. In the 1980s and ‘90s, in the face of refugee movements and the ‘Fortress Europe’ policies designed to keep them out of Europe, the experience of refugees and exiles became more central to the anti-racist movement. They were the most vulnerable communities, not only rightless and precarious, prey to politicians playing the race card, but also with no common language and only the commonality of their experience to unite them An understanding of the experience of refugees and exiles has been vital to the anti-racist movement, and the Palestinian refugee issue is one of the burning issues of our times. Perhaps no more so than now. In our fight, politicians from mainstream political parties, with a few notable exceptions, have seldom allied themselves with what used to be the progressive cause of anti racism. For the most part, politicians only joined us when causes were ‘winnable’. The Labour party has not been sympathetic to the anti-racist cause – quite the reverse, from its Commonwealth Immigrants Act of 1968, which removed settlement rights from UK citizens from Asia, to New Labour which sowed the seeds of the ‘hostile environment’ by cracking down on asylum seekers, building more immigration prisons, and overseeing more deportations. New Labour’s anti-terrorism provisions established in effect a separate criminal justice system for Muslims based on suspicion and risk, rather than guilt, and its punitive criminal justice legislation further criminalised young Black people – even while the Macpherson inquiry acknowledged institutional racism in the police. What we face today is a media circus, where politicians are manipulating issues of anti-racism, speaking out as though they were anti-racists, when over the years they have been responsible for the structures and the laws that now imprison, demonise and stigmatise BAME communities. The debate over the IHRA definition in the media and within the political establishment completely ignores the lessons from the struggle against racism. 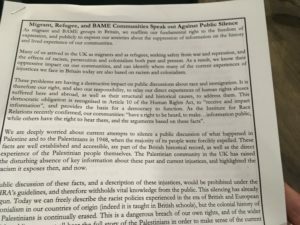 And that is what the IRR sought to draw attention to in its evidence to the Chakrabarti inquiry – the debasing of the anti-racist progressive struggle. Ironically, it was Macpherson’s definition of a racist incident as one perceived as racist by the victim – a definition which sought to address and remedy the institutional racism of police who refused to take racist violence seriously, which has compounded the confusion. Of course Macpherson meant that the perception of the victim was the starting point of any investigation into a crime. What he did not mean was to allow anyone who claimed the status of victim, to define a crime and to refuse all investigation, insisting that as victim, they have the last word. That is not justice. Racism impacts on different communities at different times in different ways. But anti-racism, the fight against injustice, cannot be differential, exclusive or sectional. It must be inclusive, opening people out to others’ oppression. Above all, it cannot create further injustice.